You Dream It. We Deliver It. They Love It. 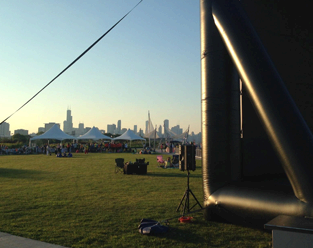 Just 4 Jumps Event Rentals provides the most distinctive, fun, turn-key corporate events in the Chicagoland area and throughout the state of Indiana. It is our passion to provide the highest level of customer service, goods and products for your amazing event. Our specialized event consultants are experienced in catering and event planning and are knowledgeable in the latest trends in the industry. This knowledge base proves to be a valuable component in our client relationships. We build partnerships through trust, commitment and excellent customer service. From an intimate gathering in your home, to a large corporate or social event catered in one of your area's most prestigious venues, Just 4 Jumps Event Rentals can accommodate all your party rental needs. Our goal each and every time is to produce events as unique as your organization.